Arrow's fourth season officially debuts tomorrow (CAN YOU BELIEVE IT?) and it has been an absolute blast getting the opportunity to not just reminisce about some of our favorite moments throughout #CountdownToArrow, but to really get excited for the show's return. We've gotten to know and hear from a lot of you during hiatus thanks to this project and I can't thank you all enough for being so supportive and encouraging, as well as engaged! This project was a massive undertaking and it would not have been possible had it not been for the amazing women who have helped support it (Jen, Meredith, Maddie, Lizzie, Lynnie, Hope, Chelsea, etc.) I'm so thankful for them and for the way they helped not just support me but also our team in the last month. Go give them some love on Twitter or Tumblr (or here!). If this is your first time reading anything from #CountdownToArrow, then welcome! If it's not and you've been with us during the entire month-long celebration... still welcome! You can check out all of the posts from the month HERE. Be sure to also come back tomorrow night after Arrow airs for my review of the episode. In our final day of the countdown, we decided to celebrate the man who makes the entire show possible: Oliver Queen. And when contemplating what kind of listicle I wanted to do, I thought that discussing the moments in which Oliver Queen was awesome and action hero-y wouldn't do him justice. Because even though Oliver is amazing as The Arrow (and now Green Arrow), what I really love is how Stephen Amell can use this character as a vehicle to convey a lot of powerful and strong emotions. 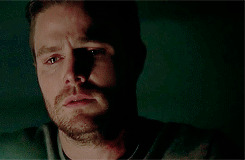 So now, without further adieu, we are going to break down thirteen moments in which Oliver Queen made us emotional. Grab your tissues and chocolate! Of all the relationships on the show, platonic or otherwise, the relationship between Oliver and Roy gets the least attention. That doesn’t mean there isn’t a depth of feeling there, though. Roy idolizes Oliver from the start, and Oliver? Though it took him a while to warm up to it, by the end of season three it’s obvious Roy has become some sort of surrogate brother. Simply put, Roy is family, and Oliver is willing to sacrifice himself for family. He just doesn’t know what to do with the knowledge that his family is willing to do the same for him. Roy taking the fall for Oliver was brilliant and sad, and one of the reasons why it was so powerful was because of Oliver’s face when he sees The Arrow appear. He knows it’s Roy. He knows why Roy’s doing it. He also knows there’s nothing he can do or say that won’t make this whole thing worse. And it’s killing him. You can see it on his face. He didn’t ask for this. He didn’t expect it. And he can’t even appreciate it. Because, being Oliver, he wants to be the one to make the sacrifice. Oliver seldom has moments where he’s allowed to just... talk. This sort of comes with the territory as the strong but silent lead. However, on his date with Felicity, Oliver seizes the opportunity to explain to her, and to us, why she means so much to him. The end result is astoundingly emotional and incredibly self-aware. Oliver recognizes his inability to trust and his fear regarding emotional attachments. It shows an incredible amount of character growth. Then, he switches tone. Stephen Amell does a wonderful job of lightening his voice and giving a little shake of his head to signal the shift in Oliver’s perception. The moment he walked into Felicity’s office... it was different. Oliver didn’t see Felicity as a target or a threat, but rather a human being. There was an instantaneous trust and emotional connection. Nor did Oliver immediately fear what that trust or connection meant. He just allowed himself to feel it. To smile. To enjoy her. Yes, Felicity was the first stranger Oliver saw as a person, but their encounter was also one of the first times Oliver allowed himself to be one as well. Oliver still doesn’t fully understand why Felicity had this effect on him and can only offer “there was just something about you.” It’s a slight wink-and-nod to the audience, because it’s what we all felt when we first met Felicity Smoak. Then, he smiles. It’s rare that Oliver smiles (although it was abundant in the first 20 minutes of "The Calm"), so it’s important to take note when he does. It was the private smile of a man in love. Felicity is embarrassed that she was chewing on a pen when Oliver walked into her office. That’s when Oliver lowers the boom. He remembers the pen color and “it was red” takes its place in the Olicity hierarchy of Greatest Lines of All Time. What makes the line so memorable was Oliver’s confidence. He was so certain because there was nothing about that moment, about her, that he doesn’t remember. When you meet the love of your life, your life changes forever and you remember every detail. If Arrow was simply about Oliver Queen’s ascension to a superhero costume, we would have ended his journey in season one. Oliver journey is about his salvation. His salvation is Felicity and their love for one another. It is the love that will transform Oliver Queen into the superhero he is destined to become... so he can be Starling City’s savior. This particular scene is some of Stephen’s finest acting to date. He maneuvers deftly between recalling his painful past and reflecting on Felicity’s impact on Oliver. Stephen brings a resonating emotional depth to the performance, so the audience understands why Oliver loves Felicity and why she is the Green Arrow’s great love. He told her in the mansion, but it was a ruse. He told her after the kiss, but it was backwards. He told her after her computer virus almost destroyed Starling City, but it was implied. Oliver told Felicity he loved her a bunch of times, but they all fell shy of the truth. Sort of like an escape plan. There can be no escape plans in relationships. You are either in or you are out. Are you in love? Or aren’t you? There is no halfway. There is only truth. Oliver decides that facing certain death seems like an excellent time to put all of his cards on the table. We are only mid-way into Oliver’s year-long identity crisis at this point in "The Climb," but he’s come away with two irrefutable truths about himself: he will do whatever it takes to protect Thea (including facing certain death) and... he loves Felicity. Oliver echoes Felicity’s: “I know two things” speech from the clock tower in "Streets of Fire." It’s a vitally important callback. Oliver was at his lowest point and it was Felicity’s assurance that he was not alone and her belief in him that brought Oliver back from the brink of despair. By echoing her words, it is further evidence this was the moment Oliver admitted to himself that he was in love with Felicity. Just as Felicity asks: “And the second thing?,” Stephen gives his trademark Oliver Queen head shake. Almost as if to say “the heck with it. I’m going for it.” Then he says simply: “I love you.” No halfways. No half-truths. No escape plan. Stephen exhales while he says it, because loving Felicity Smoak and breathing air are the same thing to Oliver Queen. What’s heartbreaking about this scene is Oliver isn’t renegotiating the terms of their relationship. He isn’t telling Felicity because he’s changed his mind about being with her, nor is Oliver expecting Felicity to say it back. Oliver just says “I love you” so Felicity knows. Oliver says “I love you,” so he said it… just once. Oliver Queen isn’t emotionally reserved because he doesn’t feel. He’s emotionally reserved because he feels too much. Oliver loves his family and friends beyond depth and measure. Yet, he seldom allows them to love him in return. Oliver takes care of those he loves, but he doesn’t allow them to take care of him. It was never enough for Oliver to love Felicity. He had to accept her love in return. What’s more, he had to allow Felicity to take care of him. On the flight to Nanda Parbat, with his beloved sister on life support, Oliver tells Felicity about the time he killed a drug dealer to protect Thea. In all reality, what Oliver is telling Felicity is not a pretty picture. He murdered someone in cold blood out of anger and love. He’s allowing Felicity to see how even the light inside of him was twisted by the dark. Oliver is vulnerable and broken because he believes he’s failed at the one job he was born to do… protect his sister. It’s like the Queen’s Gambit is sinking and Oliver is drowning all over again. Only this time the life raft he reaches for is Felicity. This is the moment Oliver allows Felicity to take care of him. This is the moment he accepts her love because he knows no matter what, it is unconditional. Sara is dead, killed living the very same life Oliver has chosen. Oliver pushes Felicity away by prophesying his own death. As he looks at Sara, Oliver knows someday it will be his body on the table. It will be his body they bury. It will be him they mourn. When Oliver tells Felicity this, there’s a resignation to it. This is simply his fate. To Oliver, life is not something you live. Rather it is the slow, but inevitable, march to death. It’s a horrifically bleak outlook and one Felicity wants no part of, understandably. First, it’s rare when Oliver uses Diggle’s first name. When he does, it’s intensely personal. In many ways, Diggle is Oliver’s compass. Felicity may harness Oliver’s light, but it’s Diggle that shows Oliver how to live his light. This is a call for help to his friend, his brother and his counselor. He whispers it, tears brimming, as if he’s scared to want to live. It is one of Oliver’s most painful, broken and saddest moments. Yet, it retains a glimmer of hope because Oliver finally admits, deep down, what he wants. And Diggle’s answer is spot-on: “So don’t, Oliver.” The choice whether he waits to die or live his life has always been Oliver Queen’s. John is simply challenging Oliver to make the choice to live. We know it’s not that easy for Oliver. He’s like a paralyzed man learning to walk again. He must fight for every painful and difficult step. Yet, as Oliver sits alone in the dark, we realize he just took the very first step. Oliver Queen is extremely perceptive. For most of “Heir to the Demon,” Oliver notices that something is off with Felicity. I mean she doesn’t even ogle him while he bangs a sledgehammer at a tire while shirtless. So when he sees that Felicity is still upset when at Moira’s mayoral announcement press conference, he needs the truth immediately. The amount of emotional layers in Stephen Amell’s voice during the following scene gets me every time. At first, there is a sense of urgency in his voice laced with the frustration that he already doesn’t know what is wrong ("Fel-i-ci-ty"). Of all the multitude of times and ways Oliver Queen says Felicity’s name, it is this instance in which he firmly enunciates each syllable to get her attention that is my favorite. Pair that with the firm but comforting reach for her arm, and I already started crying during this moment. His concern for her is so evident through this whole scene, both despite and because of the fact that Felicity’s heart is clearly breaking. Oliver needs to know the truth of what is going on. As soon as Felicity starts talking, he softens, as usual, but there is still an unease to Oliver because his Felicity is clearly still upset. His smile when recalling her talkativeness is small because his urge to make things better is at the forefront of his emotions. He immediately becomes serious once again as Felicity brings up her family. Looking at Oliver while Felicity opens up about her family, two things are clear: 1) He is most absolutely already in love with her at this point (which makes actions later in the episode all the more infuriating but that is besides the point here); and 2) it is taking everything within him not to take her in his arms, hold her tight, and comfort her. Hearing that someone abandoned Felicity is something Oliver cannot even fathom. In the moment he is hurting because the love of his life has been through the kind of pain that comes through abandonment for so long. He can barely even process it, and just want to pull her in a hug and not let go until she feels loved. Just look at him! It is the same small, soothing tone of voice used when he comforted her after saving her from The Count in "State vs. Queen," because Felicity is in the same kind of pain think of losing Oliver as she was when she was nearly killed. His voice while small and quiet is laced with so much emotion. It is comforting yet firm and resolute, and it is filled with love. This is a man that will do his darnedest to make sure she never feels abandoned again. Oliver can deal with so much pain himself, but he cannot even remotely handle Felicity hurting. That’s why I keep commenting that through the sweetness and comforting nature of the conversation, there is also a desperate quality to his voice, posture, and the intensity in his eyes. Oliver must make sure that Felicity doesn’t remain in this kind of pain for one second longer. It was a turning point in their relationship, because this became a promise that has remained true throughout the series. She has never truly lost him –– he always found a way back to her. Excuse me while I go sob in a corner now. This is still –– even after everything that has happened on the show –– my favorite Oliver/Felicity moment to date. Let’s recap what happened in the episode, shall we? Oliver killed again because Felicity was in danger. And you can see, the moment right after he kills The Count, this wash of emotions over Oliver’s face. Stephen Amell does a fantastic job at portraying everything circling through his mind -- relief that The Count can no longer hurt other people; anger subsiding; fear and anguish over the fact that he had killed again; and a sort of… exhale, almost. Like he –– in a weird way –– almost felt better having broken his vow. All of those emotions quickly transition away from his inner monologue and are channeled toward Felicity, still on the ground. Again, Stephen does an amazing job at conveying –– in quiet whispers –– Oliver’s soft reassurance that she’s okay, that she’s not hurt, that she will NEVER be hurt as long as he’s around. And that moment is great (as is the realization that Oliver is shot and, you know, brushes it off to care for Felicity), but nothing compares to the final scene between the pair in the episode. Let’s all take a moment and realize the weight of what Oliver said. He told her that he would do anything to protect her –– to keep her safe. That if it was a choice between breaking his vow and keeping her alive, there would BE no choice. It is not an internal struggle. It’s not an external one. It’s no struggle at all because it is a clear decision –– he would rescue her, no matter what it took. So when he earnestly looks her in the eyes and tells her that there was no choice to make, I believe him wholeheartedly. Even before Oliver and Felicity were together, he was protecting her. Even before he vocalized that he loved her, he loved her all the same. You know what kills me about this scene? Oliver isn’t expecting a good response from Thea. He’s not expecting Thea to understand, much less call him a hero. Oliver is expecting condemnation, even hatred just as he has seen so many times before. Because Oliver doesn’t see himself as a hero, he can’t understand how anyone else could. And yet, the League has put in an impossible position –– to protect Thea he must be truthful with her. To protect Thea, he must lose her. Because that’s what he thinks is going to happen. He thinks that by telling her, he’s going to lose her. He thinks this revelation will be the end of their bond. And yet still he does it, because there’s nothing more important than protecting Thea. And then, his face when her reaction occurs is the opposite of what he expected –– it is not relief though, not really. It’s amazement. Thea doesn’t really understand the great gift she’s giving Oliver by just loving him. But we do. And it breaks our hearts. This scene. Sigh. This scene. In and of itself, it would be emotional. Felicity has only recently told Oliver she loves him, they made love for the first time, and she tried to save him by drugging him (which made him love her even more, let’s not forget.) But then, the plan doesn’t work, and these two are being forced apart yet again. All of this alone? It's enough to make you cry. But then. THEN. Felicity comments how they are constantly saying goodbye to each other. And Oliver responds with the following: "So let’s not say goodbye this time." In the scene, while watching it for the first time, the emotional onslaught is all about the hope. The burst of light between them, the lingering touch of their foreheads, and the promise that this is not a goodbye. However, we later learn that Oliver was not planning to live through his ordeal. Meaning that here, he’s giving Felicity what she needs. He needs a goodbye. This, in his mind, is the last time he will ever see the woman he loves. But he knows that this knowledge would crush Felicity. And he can’t do it. He can’t crush her like that, not again, not now, not after what they’ve just shared. So he gives her hope. And maybe –– just a little –– he gives himself hope, too. Oliver’s fake-but-real "I love you" to Felicity in the season two finale packs a powerful emotional punch. Not only does it hold the weight of a first admission of love between these two, intensified by precarious and dangerous circumstances, but it also comes as a complete shock: to Felicity, to the viewer, and likely to Oliver himself. While their relationship, and how much she means to him, had been teased and hinted at up until this point, the true magnitude of Oliver’s feelings had never been revealed. When it is later shown that this scene was a ruse, the viewer and Felicity are left questioning whether Oliver meant what he said. But one look at his face here, listening to the way his voice softens and drops to a whisper, it is clear that this was no lie. Oliver didn’t need to tell Felicity he loves her in order to sell the scene. He had Slade fooled with just the line “he took the wrong woman.” No, Oliver didn’t need to say it for Slade. He needed to say it for himself. Much like in the goodbye scenes (all of them) in season three, Oliver just can’t imagine leaving Felicity, possibly forever, without telling her how he feels about her. He doesn’t expect to hear an "I love you" back (much like Jen noted in "The Climb"); he doesn’t want anything in return. He just loves her so much that he needs to say it out loud, just once. In my opinion, this is one of the first examples of a truly, unequivocally in love Oliver Queen. And it is a sight to behold. If there has always been one constant thing about Oliver Queen, it is how deeply and fully and truly he loves. He loves his sister, he loves his friends, he loves Felicity. And he loves his mother. Despite their differences, despite their estrangement, he never stopped loving her. He never stopped wanting to protect her. And this scene, coming on the heels of Moira admitting to Oliver that she has known he’s The Arrow all along and is proud of him, is even that much more emotional. Just when he thought he might be getting his mother back, now he is faced with losing her. He is faced with yet another impossible choice, one of many in his recent life. What is so powerful about this scene is that Oliver –– the strong, dominant hero –– is not ashamed to be begging. He is begging for the lives of his family to be spared. For Slade to kill him, instead. And you can tell he means it. From the bottom of his heart and soul, he would give his life in a millisecond if it meant both his mother and sister would live. The emotion here is so raw and real, it would take a very hardened soul to watch this scene and not cry. For Oliver, just as things were starting to look better, and brighter, and more hopeful... he loses something so dear to him. And, in his mind, it’s all his fault. He blames himself for his mother’s death, for making his sister an orphan, and for all the death and destruction that Slade has rained down on Starling City, on Oliver, and on the people he loves. His destitute and pain in this scene is palpable, and the viewer’s heart breaks with, and for, Oliver. There has been one love on Arrow that has remained constant and forgiving. This is the love between Thea and Oliver. These are siblings that share a bond not all siblings will know. They have been on the dark side of the media, their perceptions twisted by a lack of privacy, their mistakes aired for the world to see, all while experiencing tragedy after tragedy, including the loss of both their parents to murder. Neither has had it easy; both have felt beaten and consumed by the world. No matter how far they fall away from each other though, Oliver’s love for his sister, his desire to see her happy and at peace, never falters. He is the consummate older brother who would lay his life down for his sister if it means she gets even a single day more. In "The Fallen," Oliver experiences for the first time what Thea must have felt when she realized her brother was not coming home to her. He witnesses her dying in front of him. With a single look, Stephen Amell transports us into a reality where his entire family is dead, his sister gone, and into the shattered faith of a man who has nothing to ground him. The scene outside Thea’s operating room is a turning point in a lot of ways, but also a steady reminder that Oliver Queen is a man of sacrifice and deep love. With terror and agony in his eyes, Stephen Amell made us feel the loss of a sister. The king of emotional moments on Arrow, this is a perfect scene to showcase not only Stephen’s acting abilities, but all the ways in which Thea matters to Oliver. The bond between brother and sister has never been so heartbreakingly obvious as when Oliver is forced to confront a world without her. I talked about it in my review of the episode, but one of the most difficult things that Arrow has done in recent years is kill off its main character. This is because we –– the audience –– know what the character do not: that Oliver Queen is not really dead. He can't be. The entire show rides on Oliver being The Arrow and alive, after all. So when the audience is privy to such a huge secret –– such an emotionally weighted one –– how can we expect to emotionally connect to the scene on the mountaintop in "The Climb"? We can expect to connect because of Stephen Amell's performance. I watched "The Climb" while I was in California on vacation (insanely mad that I couldn't get my tablet to work for the East Coast stream, I had to settle to watch the episode the next day on Hulu in the hotel's computer lounge but it was totally worth it) and was captivated by the performance that Stephen Amell gave as Oliver. The mountaintop duel was beautifully directed and extremely well-acted. In breathless wonder, we watched Ra's al Ghul stab our lead -- our hero -- through the chest and kick him off the mountain. But before that, before the fall which Oliver would dream about for the rest of the season, we watched Oliver's life pass before his eyes as he watched it as well. Stephen Amell did so many amazing things with this scene. With no lines of dialogue after the stabbing, we watched Oliver's emotional state crumble as he remembered the most important things in his life: his mother, his father, Thea throwing her arms around him, and his tender kiss with Felicity. This moment was so powerful and so poignant and emotional. He lost. Our hero LOST. That's not supposed to happen in television shows or in comic books. The hero is supposed to have the final blow, to unexpectedly defeat the enemy. But Oliver doesn't. He gets out-smarted by Ra's and he's forced to watch his life flicker before his eyes. We feel Oliver's emotions in this moment. We feel his pain and his frustration and Stephen Amell does absolutely fabulous work as he, too, watches the life he worked so hard to build –– the people he tried so hard to love –– flash before his eyes and fade before them as well. Where is that very first gif from? - Tommy dying in the finale! - Oliver seeing Tommy's ghost in S2 & when he saw him in the S3 flashback. - Oliver thinking that Walter was dead and he failed to save him.